RASPBERRY, OCTAVIA (Rubus idaeus Octavia). Fruit. 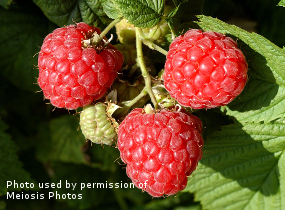 Excellent new variety which is considered to be the finest late summer raspberry filling the gap between summer varieties and the autumn fruiting varieties. Very productive with sweet, good flavoured fruit with fewer seeds than other varieties. Upright, easily managed canes. Self-fertile.Price for 5 bare-root canes (plants) or one cane (plant) in an individual polythene pot for easy planting.